Hurricane Irma approached Florida as a terrifying storm — by some measures the strongest ever to leave the Atlantic Ocean. It flattened Caribbean islands, devastated the Florida Keys and caused the largest evacuation in Florida’s history. But when Irma hit the Florida mainland, it immediately weakened and threaded the needle between the state’s major cities. It did far less damage than feared. With hundreds of lives and billions in property on the line, the way atmospheric forces nudged the storm just a few miles made all the difference. Irma was led toward the Gulf of Mexico by a massive high-pressure zone over the Atlantic called the “Bermuda High,” which year after year shuffles hurricanes west along its southern edge. Meanwhile, a mass of dry, low-pressure air — what meteorologists call a “trough” — was slowly creeping from the midwest toward the Gulf of Mexico. Forecasters knew the trough would eventually collide with the western edge of the Bermuda High, battering it until it was too weak to steer the storm. As soon as that happened, the storm would turn north. But forecasters didn’t know when the trough’s winds would arrive. And when Irma turned would determine where it would hit Florida. Some early forecasts showed the trough would turn Irma while it was north of Cuba, driving it up Florida’s spine. 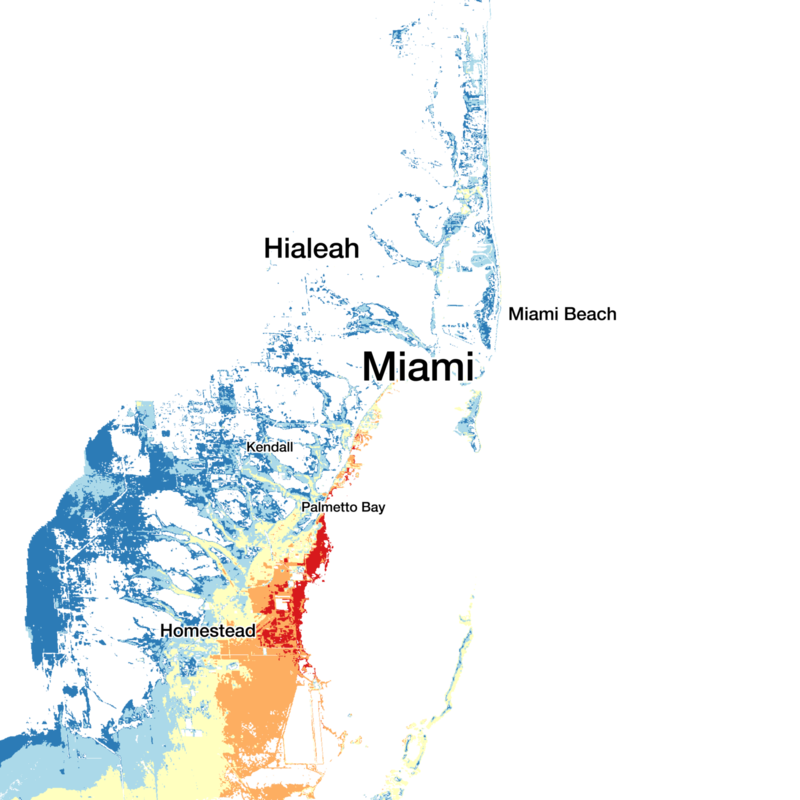 For low-lying points south of Miami and its beaches, the forecast warned that disastrous storm surge was possible. The red areas had a chance of facing more than 9 feet. But the trough was too slow. Irma kept moving west, and South Florida was largely spared. Instead, the storm hit Cuba. Irma went only a few miles inland and still killed 10 people. The brief landfall tore up the storm’s backside, weakening it. That left the storm heading straight for Florida’s western coast. Irma’s path still depended on the strength of the trough. The dry air had the potential to strengthen Irma's path and aim its storm surge toward the Everglades. But it also might be too weak, in which case Irma would shrug it off and continue northwest, along the coast. Over 4 million people live along Florida’s west coast, stretching from Everglades City to the edge of the Florida Panhandle. 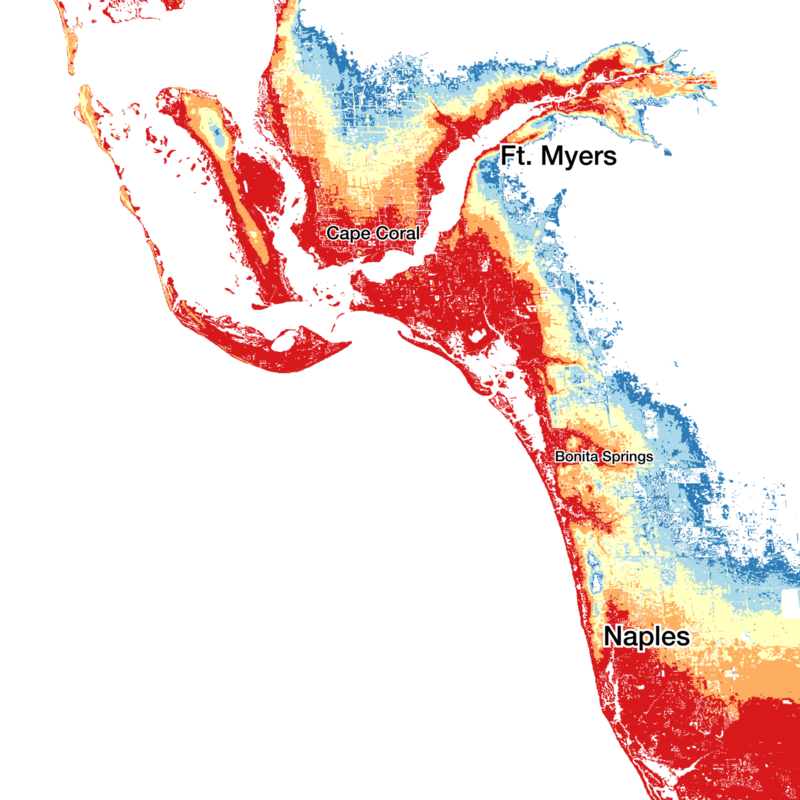 For each coastal city, the worst-case scenario was for Irma to come up alongside it, pushing a massive storm surge into densely populated beachfront neighborhoods. One forecast showed it hitting Naples or Cape Coral, which is just west of Fort Myers. A direct hit could have inundated both with seawater. Multiple coastal downtowns would have been submerged. When Floridians awoke Sunday morning, they saw forecasts showing the storm maintaining its strength over warm water, then grazing Pinellas as it passed. Irma would have hit Tampa Bay as a Category 3 hurricane, with wind gusts up to 120 miles per hour. 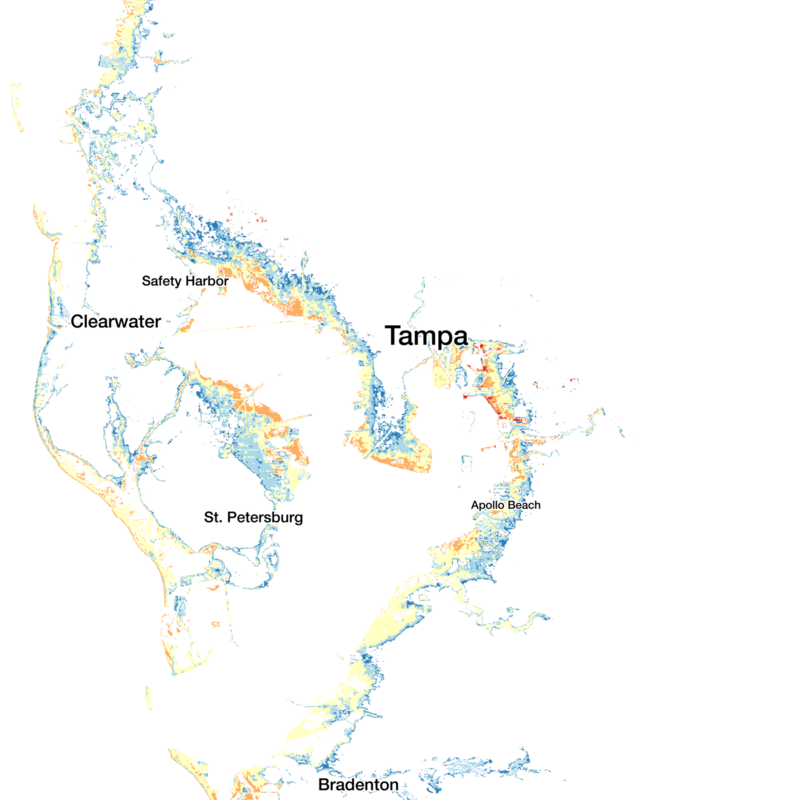 Large parts of St. Petersburg and Tampa would have been under water. So would all of the Pinellas beaches. As Irma approached the coast, the trough’s dry air began getting sucked into Irma’s vortex. But the exact effect that would have on the storm was hard to pin down. Ultimately the trough was able to straighten Irma’s path. The storm made landfall on Marco Island, 10 miles south of Naples. Though the storm was barrelling north, the miles it traveled west were all that mattered. It hit 6 miles east of Naples, 13 miles east of Ft. Myers and 50 miles east of Tampa. One final interaction between Irma and the trough kept the hurricane away from Florida’s big cities. As Irma absorbed it, the trough’s momentum caused the storm to wobble. That pushed the storm far enough west to miss Orlando, but not so far that it hit Tampa Bay or went back to sea, where it could regain strength. In the end, it wasn’t Tampa Bay’s unique geography or position along the coast that saved it. The difference between Irma’s final track and a direct hit on Tampa Bay was the storm turning just a few miles sooner. Data source: National Hurricane Center. Special thanks to the Open Commons Consortium for providing access to data from the GOES-16 satellite.